Large breed dogs grow and develop differently than those that are smaller. The growth period from puppy to adult is much longer for large breeds. It is important for growth to be regulated so that dogs do not grow too fast and stress their bodies. After this point, it’s about maintaining a healthy weight, hips, and joints. Many large breeds also have slower metabolisms which can make it more difficult to control weight during the adult years. My Great Pyrenees, Ruby Pearl, eats the same amount of kibble as a dog half her size but she still seems to stay heavier. 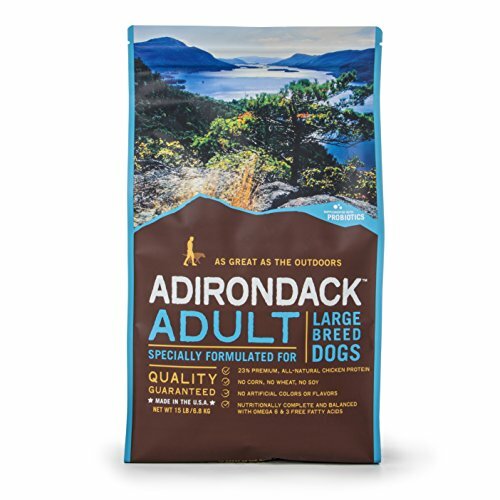 Adirondack Adult Large Breed is specially formulated to meet the needs of dogs over 50 lbs. Pork meal, brown rice, grouts, and sorghum combine with chicken fat for a flavor combination dogs really go for. Flaxseed and menhaden fish oil offer a valuable source of Omega 3 and 6 fatty acids. This helps large breed dogs maintain a shiny coat and healthy skin. If your dog suffers from skin issues, flaxseed and fish oil can definitely help eliminate dryness and flaking. Brewer’s yeast helps dogs with skin allergies. Organic kelp for a natural source of vitamins and trace minerals. Probiotics for a happy stomach and better digestion of meals. Adirondack Adult Large Breed is a good balance of protein and fat that makes it easy to maintain a healthy weight but also provides big dogs with the fatty acids and oils that they need for good joint and hip health. Copper Proteinate, Manganous Oxide, Sodium Selenite, Calcium Iodate. Adirondack Pet Food 22471 Adult Specially Formulated For Large Breed Dogs, 30lb. Gradually replace your current dog food with Adirondack over a 5-7 day period. You can increase this time to 10-14 days if you have a dog that suffers from stomach sensitivities or allergies. This dog food is great for large and giant breed adult dogs! The formula contains healthy proteins and grains as well as flaxseed, fish oil, and organic kelp. This means your dog is getting a great combination of foods to support their overall health and well-being. This dog food is suitable for big pooches that have allergies or that just need a minimal ingredient dog food that has some great supplements within it for increased immunity and joint support. I know that some pet parents are going grain free but at least Adirondack offers alternative grains like rice, barley, and sorghum rather than corn, wheat, or soy. If you are looking for a large breed dog food that offers a good value for your dollar, then it is worth it to give this formula a try.